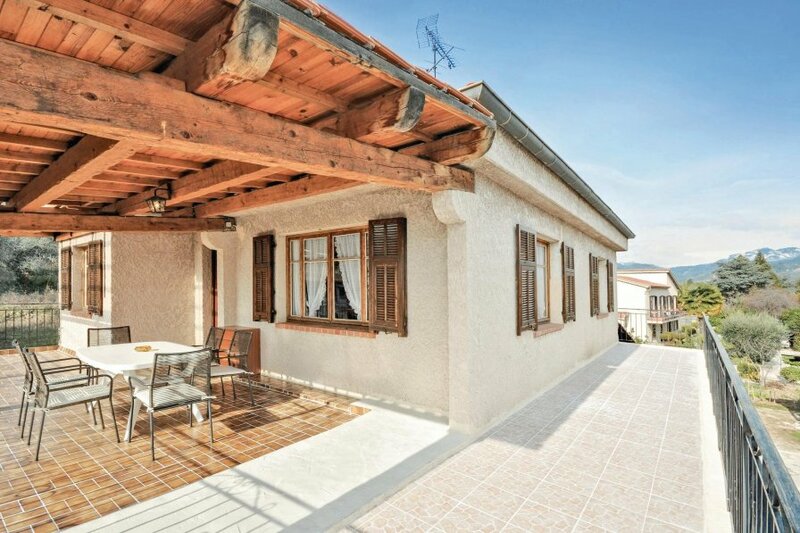 This 1st floor apartment located in the owner’s building promises you a peaceful stay in the hinterlands of Nice. The wooden beams and a predominantly rustic interior offer a cosy atmosphere. This 1st floor apartment located in the owner’s building promises you a peaceful stay in the hinterlands of Nice. The wooden beams and a predominantly rustic interior offer a cosy atmosphere. A tiled patio, partially covered by a beautiful wood ceiling, awaits you outside. An over ground swimming pool, which is shared with the owners is ideal for relaxation and comfort. Do visit the picturesque villages in the hinterlands and spend a day at the beach in Nice with its famous Promenade des Anglais and the lively old town. This solidly constructed apartment was originally built in 1960 and refurbished in 2011. The agent has rated it as a three star property so it is a well-kept apartment, equipped with standard furniture. It is also good value for money. This apartment has use of a shared pool and mountain view; it is also located in Les Ecarts-Village-Plans de Carros, only 15km from Nice. It is set in a good location: there is a restaurant only 100 metres away. The apartment has free wireless internet. You can also park on-site at no extra charge. The apartment is well equipped: it has a refrigerator, microwave, washing machine and dishwasher. It also has some garden furniture outside.